Just as much as Body Wars was Star Tours little sister, it’s the same as Iron Man Experience in Hong Kong Disneyland being the sister of Star Tours: The Adventure Continue. With no Star Tours in Hong Kong, it has been an attraction that many have been looking forward to. 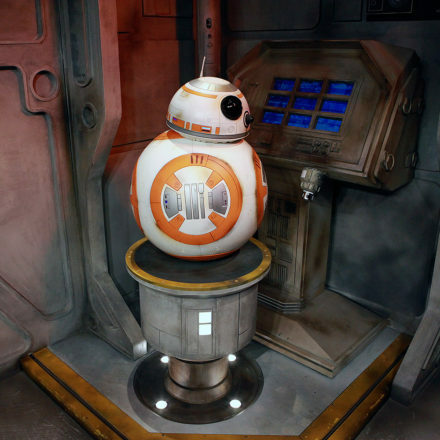 It’s interesting that early news claiumed that the retired Body Wars simulators have been re-purposed for this new adventure. Disney Parks’ first Marvel-themed ride, Iron Man Experience – Presented by AIA, will make its grand debut tomorrow (January 11) at Hong Kong Disneyland. The experience calls on all boys and girls and men and women, both young and young-at-heart, to team up with families and friends and unleash the Super Hero within in a high-flying adventure alongside Iron Man. Eminent innovator and pioneer Tony Stark is staging the spectacular Stark Expo in Tomorrowland to take guests on an adventure, starting with closely examining innovations old and new from Stark Industries. There are opportunities to meet Iron Man in person during the adventure, and to try on the Iron Man armor virtually. The grand finale is boarding a special Expo-edition Iron Wing flight vehicle and flying alongside Iron Man in the Hong Kong sky for a panoramic view of the innovatively-powered Hong Kong Stark Tower, but be prepared for a battle against the evil forces of Hydra in the immersive multi-sensory motion experience. This first Iron Man ride-through attraction and immersive interactive experience will truly make Hong Kong proud, as more than 70 Disney Imagineers from the city contributed their innovative talent working hand in hand with the international Walt Disney Imagineering team and the Marvel team to create this world’s first Iron Man-themed area. The grand opening ceremony of the much-awaited Iron Man Experience at the theme park today was officiated by the Honorable C.Y. Leung, Chief Executive of the Hong Kong Special Administrative Region, and Bob Chapek, chairman of Walt Disney Parks and Resorts. Following the previous showcase in New York in 2010, Tony Stark (aka Iron Man) has selected Tomorrowland in Hong Kong Disneyland to host the new Stark Expo to show off the latest high-tech creations of Stark Industries. The innovations are extensively displayed in four exhibition halls: the Hall of Legacy, the Hall of Protection, the Hall of Energy and the Hall of Mobility. Iron Man’s artificial intelligence computer system J.A.R.V.I.S. and Wendy Wong, vice president of Stark Industries Asia, are guides taking guests through the impressive range of exhibits, from Captain America’s prototype shield to Iron Man Mark III suit, the first miniaturized Arc Reactor, the unbreakable Stark Everglass, the MyJARVIS intelligent home system, StarkVision Glasses and a collection of Iron Wings designed for different functions. 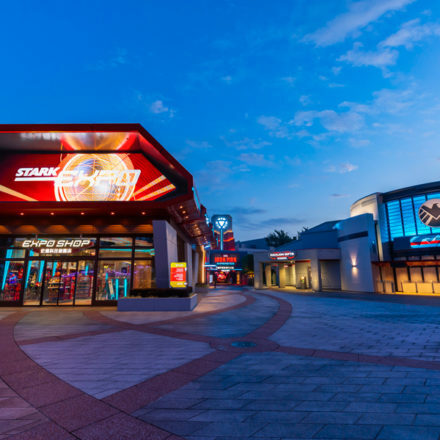 The park has spent more than three years to design and create Iron Man Experience — complete with flight simulators, 3-D projection, surround sound and other special effects that immerse guests in the Marvel story of a battle with the evil forces of Hydra. For the first time, the park has integrated strong Hong Kong elements into a park attraction by using Hong Kong and its skyline for the fly-through ride. After putting on a pair of StarkVision glasses and taking off on Stark Industries’ special 45-passenger Expo Edition Iron Wing, guests will make their way to the Hong Kong Stark Tower powered by the Arc Reactor and speed alongside Iron Man through streets that resemble those in West Kowloon and downtown, and fly over iconic Hong Kong landmarks like the Tsing Ma Bridge, Victoria Harbour and the city’s pristine mountain ranges. Iron Man Experience has received encouraging feedback from the travel trade and guests since soft opening in mid-December. Among the 270 travel trade partners who attended the preview, 95% believed their clients would enjoy the ride, 91% felt their guests would visit Hong Kong Disneyland specifically for the new attraction, while 88% expected their guests would visit the park more frequently as a result. More than 200 guests who attended the sneak peek were interviewed, and almost all (98%) said they had an enjoyable experience, while 97% remarked the experience exceeded or met their expectations. They said the immersive ride-through offered a great sense of reality and thrills, while the Heroic Encounter with Iron Man brought close interaction and an elevated sense of authenticity. 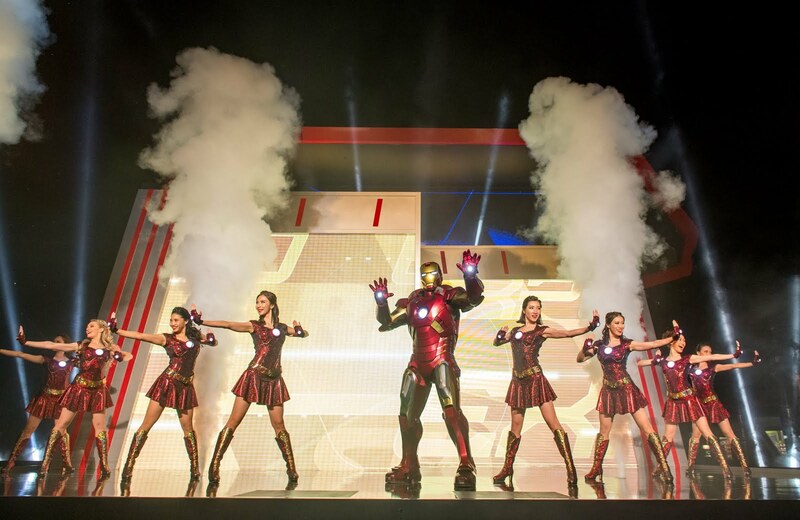 The launch of Iron Man Experience will fire up Hong Kong as the Super Hero takes over the entire city on all communication channels! On the street level, an Iron Man billboard will dominate one of the busiest traffic areas – the Cross Harbour Tunnel. Also in three key locations in Hong Kong, Kowloon and New Territories, pedestrians are able to encounter Iron Man on the busy streets of the city with the use of AR technology. On the digital level, with the Hong Kong Disneyland interactive site and location based banners, users will have a chance to find Iron Man himself in all 18 districts of Hong Kong starting from mid-January. Furthermore, this excitement extends to TV with the airing of the commercial voiced over by the Chairman Emeritus, Marvel Entertainment, LLC and Co-Creator of Iron Man Stan Lee himself. This unprecedented level of outreach for Iron Man Experience will create extraordinary anticipation for this first-of-its-kind experience. In February, Hong Kong Disneyland will launch the “We Did It Award” program for all 520 local secondary schools. Under the program, the resort will donate more than 20,000 admission tickets to award students with outstanding volunteer service. The program aims to encourage secondary school students to act like a Super Hero in serving people in need and making a positive impact in the community. It’s part of the celebration of the 20th anniversary of the establishment of the Hong Kong Special Administrative Region. Iron Man Experience is complemented by a range of Iron Man-themed fun. The brand-new Expo Shop lets guests choose from a range of 70-plus Hong Kong Disneyland-exclusive Iron Man merchandise items and more than 250 Marvel-themed memorabilia items. Among them are collectibles and toys, glowing key chains, souvenirs and accessories. Some of the exclusive apparel features Hong Kong’s postcard-perfect scenery and Stark Expo themes, as well as a special Iron Man Experience Pin available for a limited time nly starting January 11 — a must-have collectible! In the Expo Shop, Iron Man fans get to try on Iron Man’s armor suit in the interactive experience Become Iron Man at The Stark Expo – Presented by Fuji Xerox. Through interactive motion-sensing technology, guests can experience the flying and shooting functions of the armor and feel what it is like to be a Super Hero as they fight the forces of evil on streets resembling downtown Hong Kong. Guests can also take home a memento package featuring a digital photo collage of their Become Iron Man adventure as well as a digital download of an approximately 35-second video of their transformation. The park and hotel restaurants have prepared more than 25 Iron Man-themed food and beverage choices for guests to refuel after a trip on Iron Man Experience. Among the delectable choices are an Iron Man Waffle, Iron Man stein, Iron Man desserts at Chef Mickey and Iron Man beverages served at the resort hotels. At the Iron Man Tech Showcase presented by Stark Industries, guests will find prototypes of various Iron Man armor suits. Here, Iron Man appears in his special Expo-edition Iron Man suit to interact with guests. To complement the launching of Iron Man Experience, park admission tickets will feature Iron Man theme artwork starting from January 11.